"i am extremely nostalgic.... almost cripplingly nostalgic. not really even about my own past. that line in "world of tomorrow" i gave to emily, "you will feel a deep longing for something you cannot quite remember," i sort of feel that constantly." - Don Hertzfeldt, from a reddit AMA where he was asked to "tell us something about yourself that we may find surprising"
Like Hertzfeldt, I too have that crippling sense of nostalgia and yearning for a past I can't possibly get back, or perhaps a past I was not even a part of. 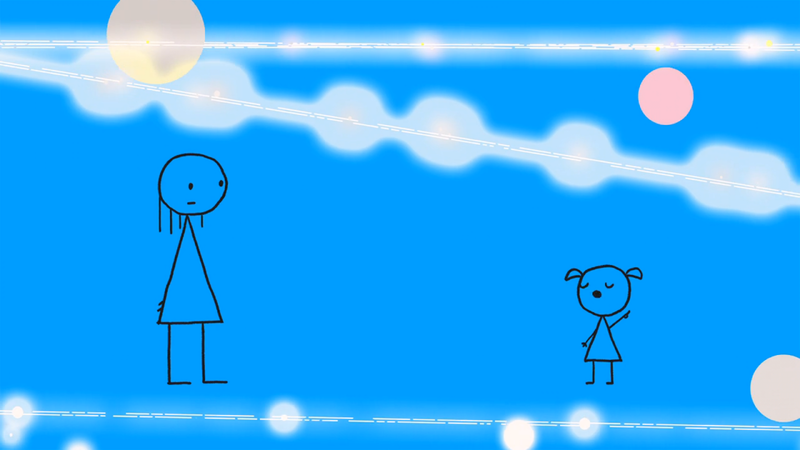 Hertzfeldt so vividly captures those exact sentiments in 'World of Tomorrow', so much so that, as Emily Prime begins describing what was in store for young Emily, it hit my like a brick and emotionally resonated with me like few other films have. As I sat staring blankly at the end credits of the film that I just watched for the third time (two of those viewings were today), 'World of Tomorrow' forced me to ask questions to myself about my life, future, and existence in general. A series of questions that I can't possibly answer now, nor anytime soon, but ones I look forward to answering in the future. "I'm very proud of my sadness, because it means I am more alive." 'World of Tomorrow has a runtime of just under 15 minutes, sans end credits, and there is not a single wasted second in any of those minutes as Hertzfeldt crafts a world that is simultaneously different and familiar. A world of futuristic contraptions yet the same sentiments that are present in our modern times. The film resembles some of the great science-fiction landmarks of cinema, in that it reaches for the impossibly complex questions and has its own unique and thoughtful answers to them. "One day, when you are old enough, you will be impregnated with a perfect clone of yourself, you will later upload all of your memories into this healthy new body. One day, long after that, you will repeat this process all over again. Through this cloning process, Emily, you will hope to live forever." The relationship between Emily & Emily Prime is awe-inspiring. The concept of a small child meeting a copy of herself from the future who is explaining the universe to her in ways the child can't possibly comprehend, poses plenty of opportunity for beautiful and complex revelations, and Hertzfeldt makes the absolute most of them. The relationship is a touching portrait of innocence and innocence lost, and the glaring differences between how children and adults view the world. Young Emily sees the world how most children do, with wonder and excitement, proudly showing Emily her toy cars and gasping at colors, circles and stars. Emily Prime, on the other hand, has been broken down by the world, too many lost lovers, and the yearning to relive her happy memories. The "conversations" had by the Emily's garner so many emotions, the interactions are very humorous and quirky, but at the same time it's heartbreaking to see the way in which Emily Prime talks to her young counterpart, with both regret and sadness. In my estimation, there are few filmmakers who truly understand humanity quite like Hertzfeldt, which is ironic seeing that he has never made a live action film. From 'Rejected' to 'The Meaning of Life' to his 'Bill' trilogy, Hertzfeldt has always had his own unique perspective on life and 'World of Tomorrow' may be his most unique yet. It's truly incredible the way in which he takes these simply drawn characters and makes them feel as real as any human character. Even Dave, an art exhibit of a human without a brain who lives his life in a museum and has profound effects on the people who visit him and is seen only briefly through flashbacks, feels so real and so human. Emily Prime is another fine example of that as you can genuinely feel the underlining sadness and emotion in her voice, despite being a character with very minimal facial expressions. This is both a testement to Hertzfeldt's writing and direction, as well as Julia Pott's voice acting. "Do not lose time on daily trivialities. Do not dwell on petty detail, for all these things melt away and drift apart within the obscure traffic of time." The above quote really hits home for me every time I hear it. I spend so much of my time and energy worrying about the little things in life. The petty details that seem so monumental but are just so miniscule in the grand scheme of things. This film makes me want to change that and do things differently, only the really special film can make you want to alter your life in some way. "Live well and live broadly, you are alive and living now, now is the envy of all of the dead." Admittedly, this review is a bit of a mess but 'World of Tomorrow' is such a personal experience that every viewer will digest in their own way. This film means a lot to me and it is quite difficult to really put it into words, and I'm sure it's the same way for other people who love the film too. What I can say is that 'World of Tomorrow' is so absolutely wonderful, both heartbreaking and hopeful, and simply brilliant beyond belief. Don Hertzfeldt is a master storyteller who has formed a career on the fact that storytelling isn't about extravagances or large budgets, he has always conveyed the universal truth that a good story is a good story, no matter the package they come in. In just 17 minutes, Hertzfeldt's film made me think about humanity, life and existence as much as anything ever has. Hertzfeldt is an artist in the realest sense. 'World of Tomorrow' is available to rent on Vimeo for $4.99 and renting it is a great way to kick back to Hertzfeldt and give him the opportunity to make more masterpieces in the future. I've rented it last two months and will continue to do so for the foreseeable future.